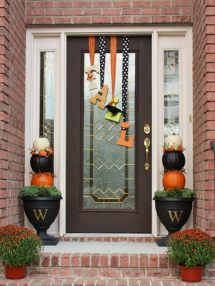 As the weather turns cold and the leaves start falling, it's the perfect time to dress up the front of your house with fall décor. Check out these inspired ideas from around the web to get you started. 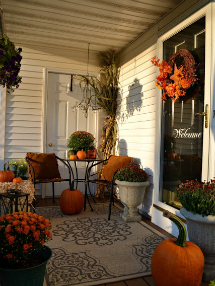 Your front porch makes a statement about your entire home, so why not impress your holiday guests and go all out with your fall decor! If you would love to decorate but aren't sure where to start, get a little inspiration from these fabulous front porch ideas. We love this cozy looking front porch from Everything has a Place. The rug makes the space extra warm and inviting while pumpkins, mums and a few stalks of corn bring the whole look together. 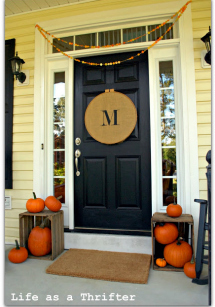 This monogram pumpkin tutorial from The Butlers Blog is the perfect way to personalize your front porch decor with your initial. The pumpkin is neutral enough that you can leave it up September through November! Huckleberry Love made a lovely display of fall mums and bright pumpkins, all stacked up on a bale of hay for an easy-to-assemble look that says "fall." 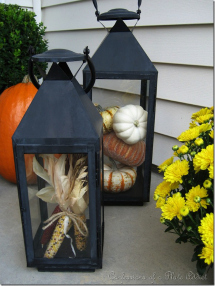 Grab a few lanterns and fill them with fall items such as dried corn, pumpkins and fall leaves. These DIY lanterns from Confessions of a Plate Addict can easily change with the seasons by adding winter or spring decorations so that they work all year long. Kim from Sand and Sisal made a whimsical front door decoration with Mod Podge, letters and scrapbook paper. You could easily customize this decoration to match your own style — Kim even wrote a tutorial to show you how! 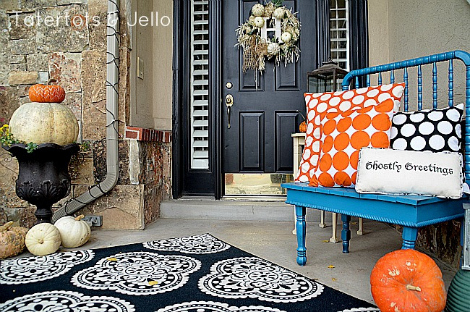 A few bold pops of color help to balance out the neutral cream and black decorations on this delightful front porch from Tatertots and Jello. 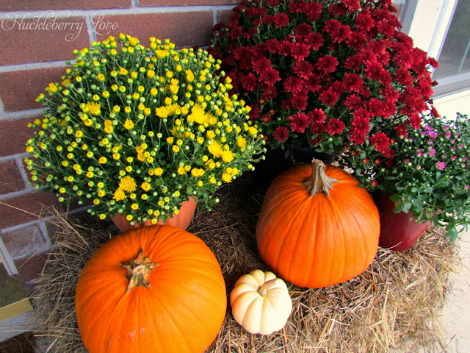 Your front porch decor doesn't have to be over the top. 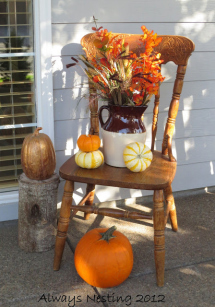 This simple display from Always Nesting incorporates an old chair, some pumpkins and a pitcher into the perfect front porch ensemble. Holly from Life as a Thrifter stacked a few pumpkins inside some old crates for a charming and rustic look that's perfect for fall! Some monogrammed burlap stretched over an embroidery hoop creates an easy and inexpensive front door decoration.